This is one of my favourite dishes because it’s simple, homely and very tasty. The caramelised fillet is accompanied by a classic cmbination of pork belly, apple puree and crackling. 1. Preheat oven to 250c. Place pork belly on a baking tray and rub the skin with olive oil, brown sugar, thyme, garlic, and salt. 2. Cook on a high heat for 20 minutes then reduce temperature to 150c and continue cooking for 1 hour 40 mins. 3. Wrap the pork fillet tightly in parma ham and fry in a pan at moderate temperature for 5 minutes. 4. Then bake the fillet in a hot oven for a further 8 minutes until cooked through. Leave to rest before carving. 5. Peel and chop the apples then place them in a saucepan with the butter. 6. Cook until softened then blend in a food processor. 1. Place the apple puree in small drops onto the plate. 2. Add the pork loin & pork belly and garnish with rosemary. 3. Break up some of the pork belly crackling and scatter a few pieces on the plate. 4. Serve with mashed potato or potato gratin and use the cooking juices in the baking tray as a base for a good gravy. The nose of this wine is quite enticing with aromas of wild berries, fleshy damsons and lick of liquorice with some earthy tones. This wine has a light to medium body with all the aromas from the nose popping beautifully on the palate along with blueberries, violets and a light leafy touch. A classic example of a pinot noir made with great care. It will pair nicely with crispy duck, lamb and pork. David Mageean hails from the little coastal village of Portaferry in Co Down. He went to BIFHE Catering College in Belfast and then gained a position at Nuremore Hotel. Working under the incredibly talented Raymond McArdle, David worked his way up the kitchen to Chef de Partie. After 5 years David was offered a position as Head Chef in the newly reopened Victoria restaurant in Belfast. After 3 years absence he returned to the Nuremore, this time as Head Chef. 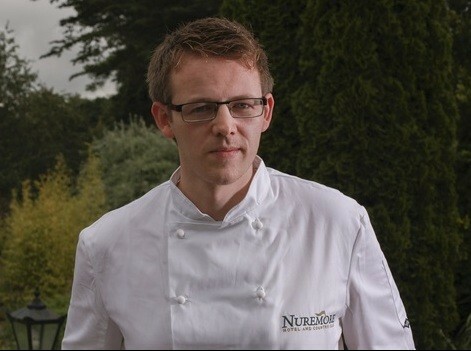 Over the last number of months David has steadily maintained the high standard of food the Nuremore has become synonymous for, while at the same time driving the food experience forward and developing his own style of fine food. Next story Roast Fillet of Monkfish Recipe by Aqua Restaurant with wine pairing.